It was another beautiful morning, and we met on the patio again for breakfast. The whipped hot chocolate was still marvelous. We had another leisurely breakfast, watching the birds in the bougainvilla and the palm trees. After we finished eating, we returned to our rooms and packed our bags. We gathered our supplies for the day, including water bottles, and went to the office to check out of the hotel. We inquired about storing our luggage for the morning. They were kind enough to allow us to store the luggage in an unused room which we would be able to use when we returned from the Zona Arqueológica to change clothes. When we had moved everything we walked down the road to the entrance of the park. This morning we were surprised; there was no admission charge on Sundays. We again entered through the arching branches of the low trees. 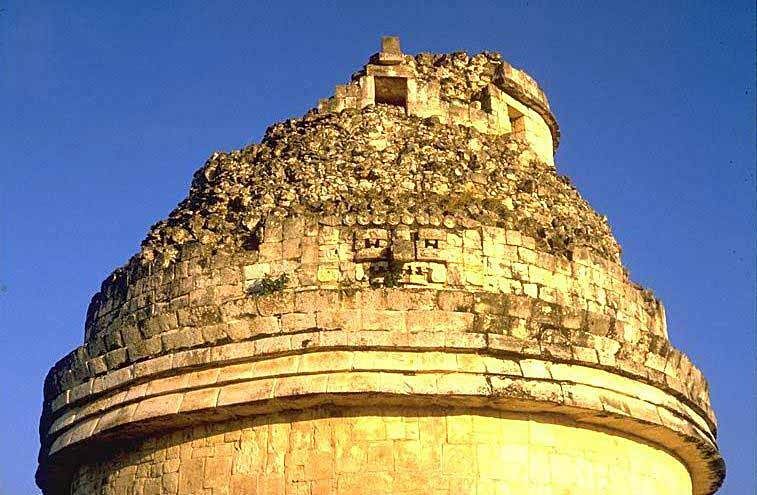 When we broke out into the Central Plaza, we were again in the presence of El Castillo, the Temple of Kukulcán. 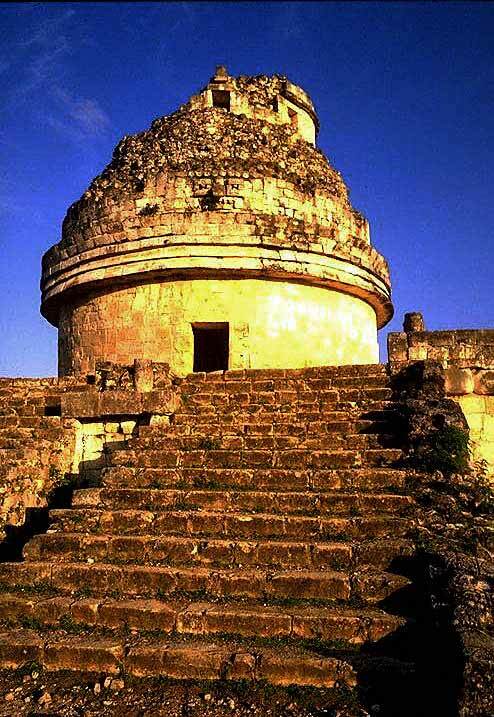 This time, after spending a suitable amount of time admiring the pyramid, we turned toward the south part of Chichén Itzá. We walked through the displays of the vendors who wanted to sell us souvenirs, plastic replicas of the calendar stone (Aztec! ), t-shirts, onyx chess sets and carvings, sodas and snacks. 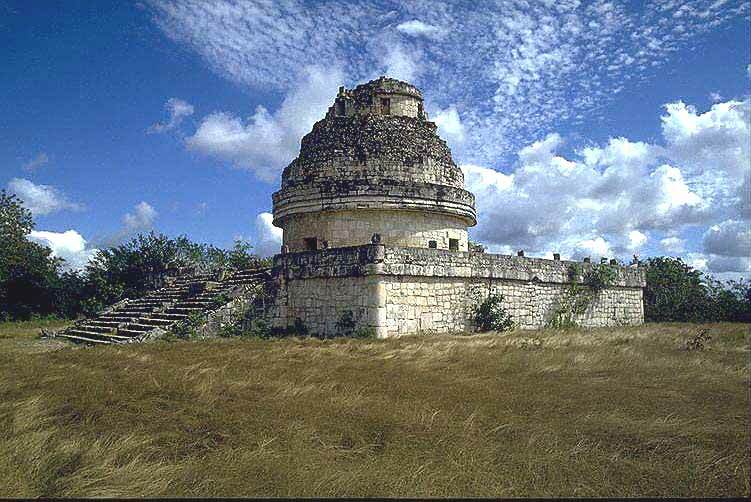 We passed the Tomb of the Chief Priest on the way to our objective, El Caracol. Steve and I went ahead to investigate the old observatory while Suzan and Ryan walked through the smaller structures in the surrounding area. We climbed the two sets of stairs to the large platform surrounding the circular structure. First we walked around the "dome" before examining the interior. There had been a substantial collapse on one side of the structure. Inside the circular building it was much darker. The ceiling was very high. We could hear squeaking above and some scrabbling sounds. It took a lot of concentration to find the bats hanging from the upper crevices. Finally I located them with my field glasses. When Ryan arrived, we told him about the presence of the bats and he wanted to see them right away. Some other American tourists who were on the upper platform heard us talking about bats. The women immediately started squealing and protesting that they didn't want to enter the dome. 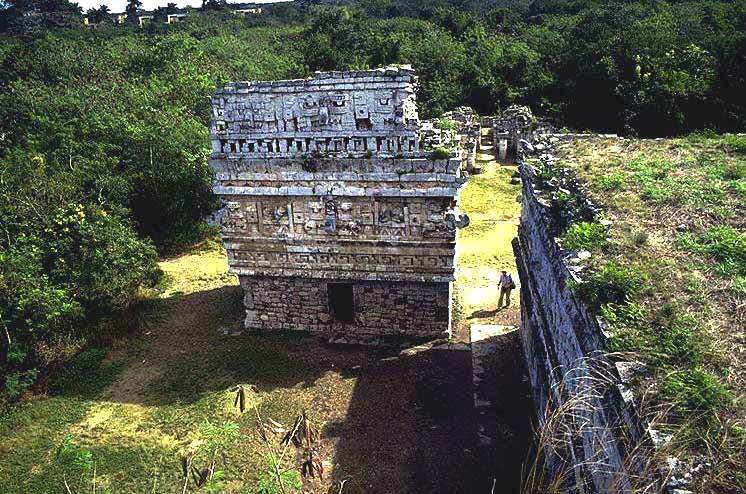 When we returned to the outer platform where we had a wonderful view over the entire area, we were again required to hear more embarrassing conversation, in English, of course, about how, if these guys had only known about concrete, these buildings would be in better shape! Fortunately these ignorant people left shortly, and we were able to enjoy the fantastic view. The platform had human heads carved into the balustrade surrounding the platform. 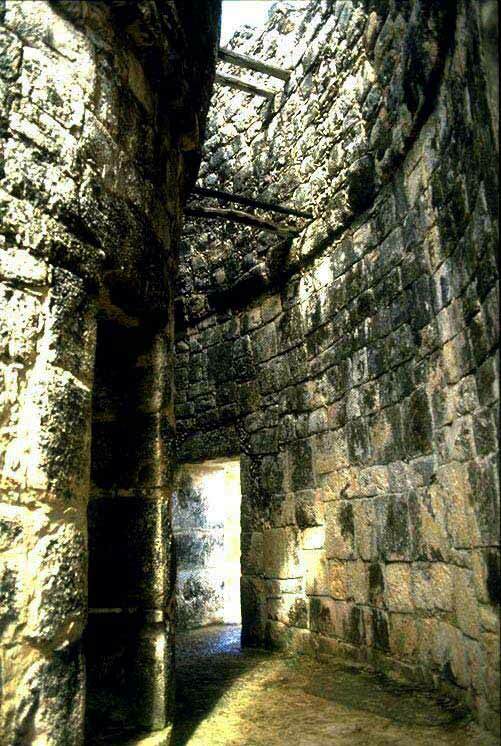 From El Caracol we wandered on to the Nunnery and its Annex covered with masks of the rain god, Chac, but the curving snouts were long since gone. A few snouts remain on the higher level masks on the facades of the Nunnery itself, seen on the righthand side of the picture. 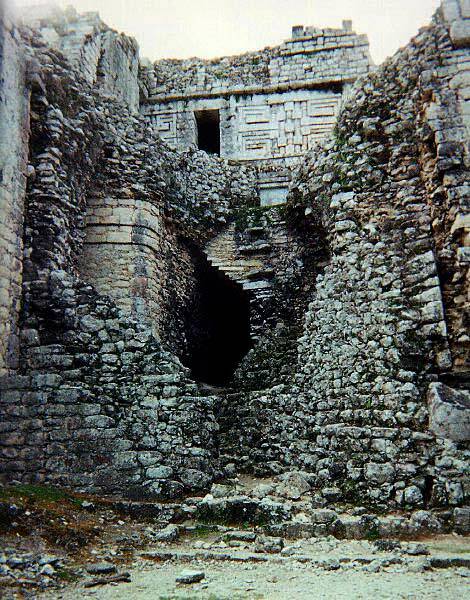 Part of the outer structure of the Nunnery had collapsed, showing the earlier stages of construction beneath the present exterior. While we were there swallows kept flying in and out of the deep opening, to their nests inside. The finished walls of the building that had been covered by the newer, more massive structure, can be seen surrounded by the rubble fill that was used to support the new building. At the top, the remaining facade of the upper level of the Nunnery can be seen. 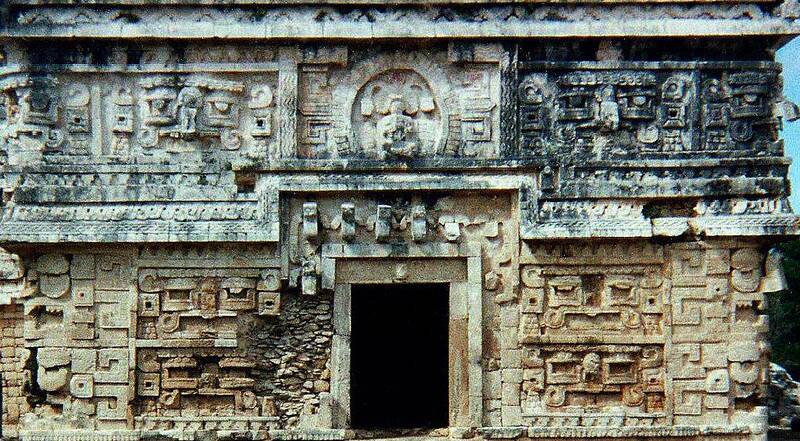 The Spanish seemed to be obsessed with women, designating at least one structure at each site as a nunnery! After exploring the buildings in this area,including a small one names the Iglesia, or church, we searched for, and found, a trail to a small building nearby called Akab-Dzib (Obscure Writing), named for some hieroglyphs found on the door lintel, including a date which translates to 870 AD. We found the building; it was very simple and almost undecorated. After a short exploration of the area, we decided that it was time for us to find our way back to the hotel. 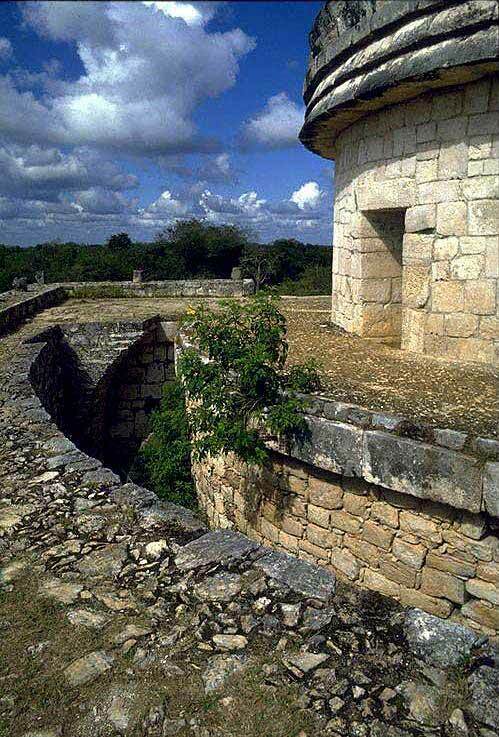 We headed back to the Nunnery from where we could find our way back past El Caracol, through the vendors to El Castillo again and then through the arched path through the trees to the entrance. We then returned to the hotel where the manager was kind enough to allow us to use a vacant room to change into our bathing suits for a swim before lunch. We had a leisurely lunch while our bathing suits dried, not wanting to leave the area. But Steve and Suzan (& Ryan) had to catch a flight to Cozumel this evening to attend a meeting which begins tomorrow. I would stay overnight at Cancún and then fly out in the morning for Albuquerque. So we finally decided that it was time to go. We placed our suitcases in the VW bus and climbed in. 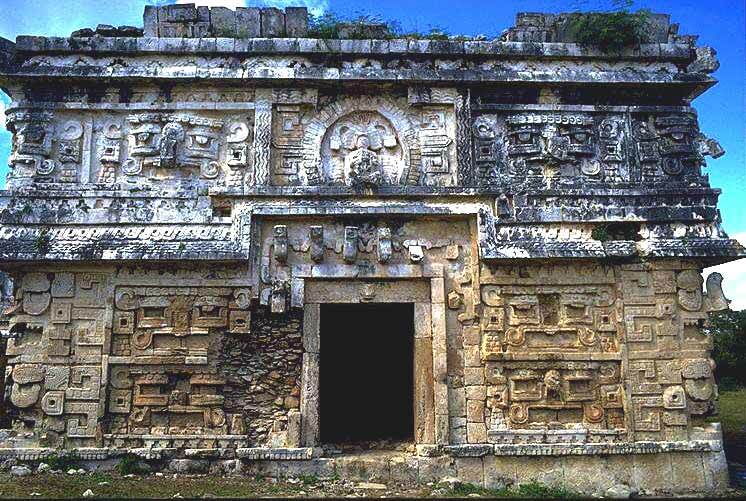 We were only minutes from the highway (which not long ago ran straight through the middle of Chichén Itzá!) and were quickly on our way. On the drive back we paid our respects once more to the couple who ran the small store at the rest stop and purchased some soda from them. Then we hurried on to the airport south of Cancún. At the airport Steve, Suzan and Ryan gathered up their luggage, and we all headed inside to find the plane to Cozumel, where they would spend the next week. It was easy to locate the correct line since all of the astronomers were congregated there. Because the plane was small, they had to check all of their luggage. After getting them off, I returned to the car, but it would not start. No matter what I did, the engine would not turn over! Finally, I gave up and walked over to the Hertz office. There I was met with always friendly, but definitely unhurried service. It seems that, no matter how the rental was arranged, it takes at least 40 minutes to an hour to complete all of the formalities, even if you are Mexican. So I decided that I might as well be Mexican, and wait and watch. Finally, someone was ready to take me to the car to get my luggage and to drop me at the airport to find a cab (I thought) to the hotel. After trying unsuccessfully to hail one of the passing cabs, I looked for someone with whom I could establish at least some rudimentary communication. I then found out that cabs were not allowed to pick up passengers at the airport. You had to take a limosine service, so I was directed to the tables where I could arrange for a ride. I had to wait for about half an hour until the next flight arrived before the limosine would leave so I changed cultural modes of behavior again and became Mexican. On the ride in, the driver passed my hotel without stopping and I had to obtain some help from my fellow passengers to make him understand that we had passed my hotel. Fortunately provision had been made on the divided highway for U-turns and I was dropped at the hotel without having to make the entire circuit.